It’s President’s Day on the calendar, but King’s Day on the blog today: “The King’s Speech,” directed by Tom Hooper from a screenplay by David Seidler, is as of this writing the movie to beat at the Oscars. I first saw this movie six months ago at a public screening at the Toronto International Film Festival, where Hooper told the crowd that Seidler had long wanted to write this screenplay and approached the royal family decades ago, but agreed to the Queen Mother’s request that he wait until she died, “little realizing that she would live to be 186.” She was, in fact, 101 when she died in 2002, but I suspect she might have smiled on this screenplay, a warmhearted and surprisingly funny account of how a reluctant king overcame a devastating stammer to unite his country in wartime. That summary doesn’t sound particularly compelling, and I meet people every day who think this movie sounds like it’ll be boring. But, once they get out to the theater, things change; other than “Toy Story 3,” this is the only Best Picture nominee that I can’t recall anyone telling me they didn’t like. As is inevitable with front-runners, “The King’s Speech” has been experiencing a bit of a backlash in recent weeks, with stories questioning its historical accuracy, such as this one. (This might be a bigger issue if Mark Zuckerberg hadn’t been repeatedly saying that “The Social Network” got a lot of things wrong, too.) But I think the Academy will embrace this lovely, old-fashioned (in the best way) film, the same way audiences have. Total Oscar nominations: 12, including best picture, director, original screenplay, actor (Firth), supporting actor (Geoffrey Rush), supporting actress (Helena Bonham Carter), art direction, cinematography, costume design, score, editing and sound mixing. Best chances for a win: Colin Firth will win the statuette he probably should have taken home last year for “A Single Man,” and that’s probably the surest thing of this year’s Oscars. (And very, very well deserved.) Right now “The King’s Speech” looks like a good bet to win the top prize, though I’m thinking this might be one of those years with a director/picture split. (I can imagine an Oscar voter rationalizing that “The King’s Speech” was his favorite movie, but “The Social Network” was better directed in the sense of seeming to be more directed, so marking David Fincher in the directing category.) I think Rush is likely to stay seated, but that Bonham Carter might surprise in the supporting actress category; I think there’s a lot of affection for her out there, even though her role was less showy than some other nominees. Elsewhere, “TKS” is a good bet for art direction (though probably not costumes; Colleen Atwood’s for “Alice in Wonderland” seem more likely to take the prize), score, and original screenplay. I’m guessing it’ll take six of twelve. Odds of this movie creating some fabulous Oscar-night weirdness: Well, this is a Harvey Weinstein film, so who knows what might happen. And I think the best reason to tune in to Oscar night is to see what Bonham Carter, one of the few actresses around who has a sense of humor about fashion (she sported a veiled hat and gloves at the Academy luncheon, and what appeared to be a weirdly decaying Hawaiian tutu at the Golden Globes), wears on the red carpet. I never can resist a good hat. 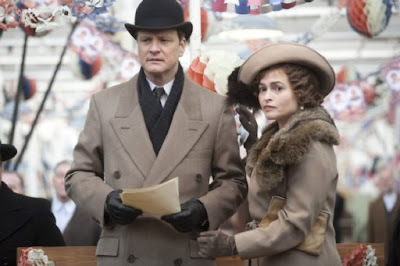 Colin Firth and Helena Bonham Carter in “The King’s Speech” (photo courtesy The Weinstein Company).